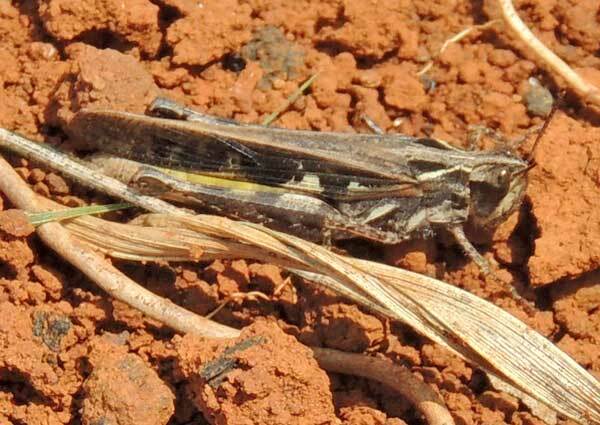 Grasshopper found within an agricultural field in Eldoret, Kenya. July 2014. Grasshoppers when numerous can make producing food in a garden difficult. One defense that farmers can use it to make the area habitat suitable for fiscals, a beneficial predator of grasshoppers. The color pattern of this insect is all about remaining obscure from these and other birds with extraordinary vision. Imagine how this insect sits on the ground among short thatch of brown and gray. There its camouflage would be near perfect. A sharp pattern of black even serves to hide the size and shape of the head.